Voice searching technology is changing the way we browse and shop on the internet. We can look up almost anything on the web just by saying, “Hey Google…” or “Hey Siri…” We can even turn on the lights, send texts, play music, and plan our day with a quick verbal request. As voice searching continues to gain popularity among all age groups, businesses must rethink their Search Engine Optimization (SEO) strategies and how they write their web page content. According to Forbes, OC&C Strategies Consultants found that voice search accounted for $1.8 billion on Amazon’s 2017 sales. They predict that sales will increase to $40 billion by 2022. 44% of people regularly use voice-activated technology order groceries, household items, etc. at least once a week. 20% of inquiries on the Google app are by voice searches. 22% of voice searches are for local information and 30% are for general information, according to Mary Meeker’s Annual 2016 Internet Report. Garner reports that by 2020, voice-activated searches will account for 30% of web browsing. Emarketer predicts that in 2019, 39.3% of Millennials, 17.2% Gen X, and 10.1% of Baby Boomers will use their voice-enabled digital assistant on their devices. So, how can we incorporate voice searching in our SEO strategy? Search engine algorithms are based on multiple factors that relate to your web site’s content. This is why in addition to producing quality content, it’s essential to incorporate keywords and metadata into your site. A schema markup is essentially like metadata, which is a set of code that helps search engines organize and classify your website’s content and enables search enhancements. You can use schema markups to optimize information that voice search users will be looking for, like contact information, operational times, directions, and so on. It may seem daunting for those who are not familiar with coding, but this is an important tactic to use. If you need assistance on any of your web-based needs, give Team Vision Marketing a call. We have extensive experience designing web sites and developing innovative digital and SEO programs for our clients. Check out our web design and marketing work in our portfolio. It requires less effort to say a complete sentence than typing out one, which is why voice searches tend to be longer and more conversational than traditional search engine phrases. Thus, brands should be writing content in a natural speaking voice that includes long tail keywords, which are search phrases that are three to five words long. It might also be worthwhile to test bids on long tail keywords. 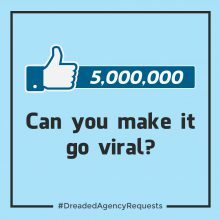 For example, Team Vision would bid on keywords like “Top Hawaii Marketing Agency” or “Hawaii Advertising Agency”. Tip: Use Google Search Console to see what voice searches you’re currently showing up on and brainstorm more voice searches your web site can relate to. Along with general inquiries, voice search users can have stronger purchasing intent. So, it might be ideal to test full question keywords or answer questions, like “Where is the closest cafe?”. The type of question can indicate the degree of desire. 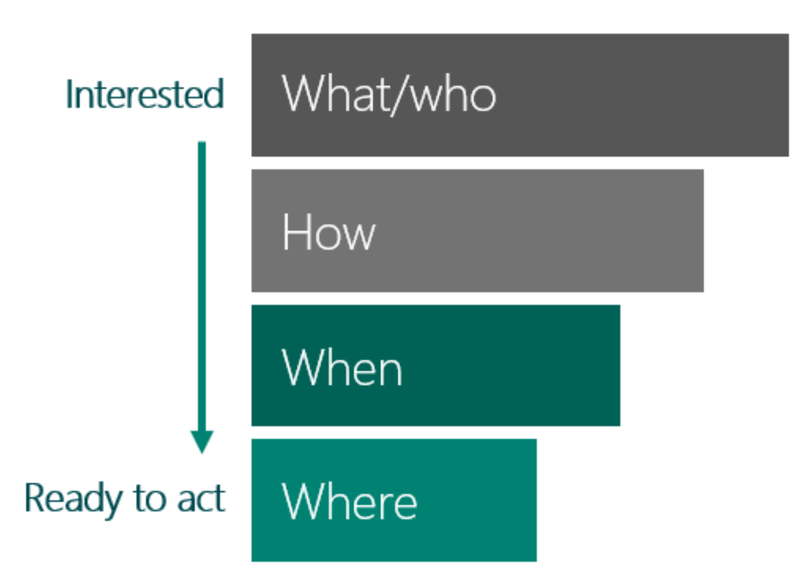 As explained on Moz.com, questions that begin with “Who” or “What” reveal interest, while questions that begin with “When” or “Where” shows more intent on an action. This also means that voice searches can have more specific inquiries, such as “Hey Google, search for mid-century furniture near me.” This is good news for brands that target a more niche audience or sell a specific product. 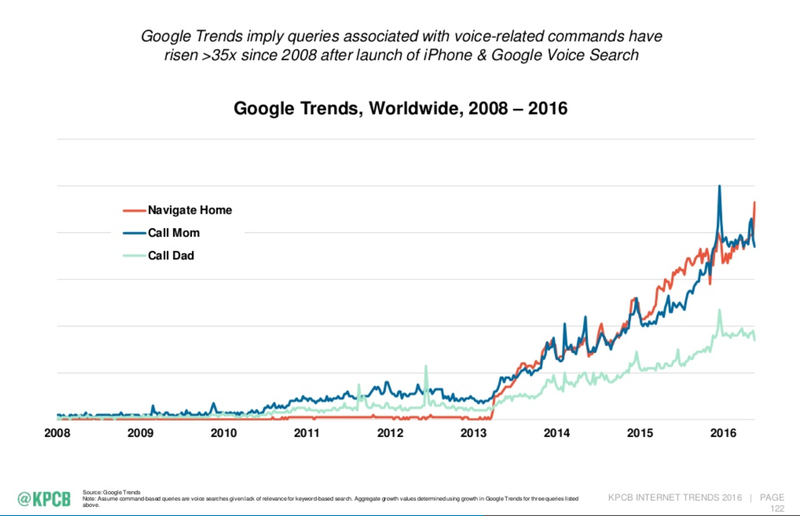 Although your business should already have done this, it has become even more essential to claim your business on Google, now that more local or “near me” inquiries are made on voice searches – as seen in the graph below. Claiming the business gives you the ability to list what category it falls under, give some details about your products/services, and input the correct contact information. This will help your customers find your business easier during searches, provide accurate information, and it can help increase your ranking on the search engine results page (SERP). It’s imperative and highly recommended that your web site is converted to be responsive on all devices. Due to the fact that a majority of Google searches, including voice searches, are made on mobile, Google factors a web page’s mobile format into its search engine ranking algorithm. It also provides your audience with a seamless and more enjoyable web experience. When a site is mobile friendly, the web site automatically formats the content to fit within the width of the screen, making it more aesthetically pleasing, easier to work with, and it keeps your bounce rates lower. Since questions are more likely to be voice search phrases, optimizing your FAQ page would be worth your while. FAQs pages are another opportunity for businesses to add in more searchable long tail keywords, which can make your web site more attractive for voice search results. 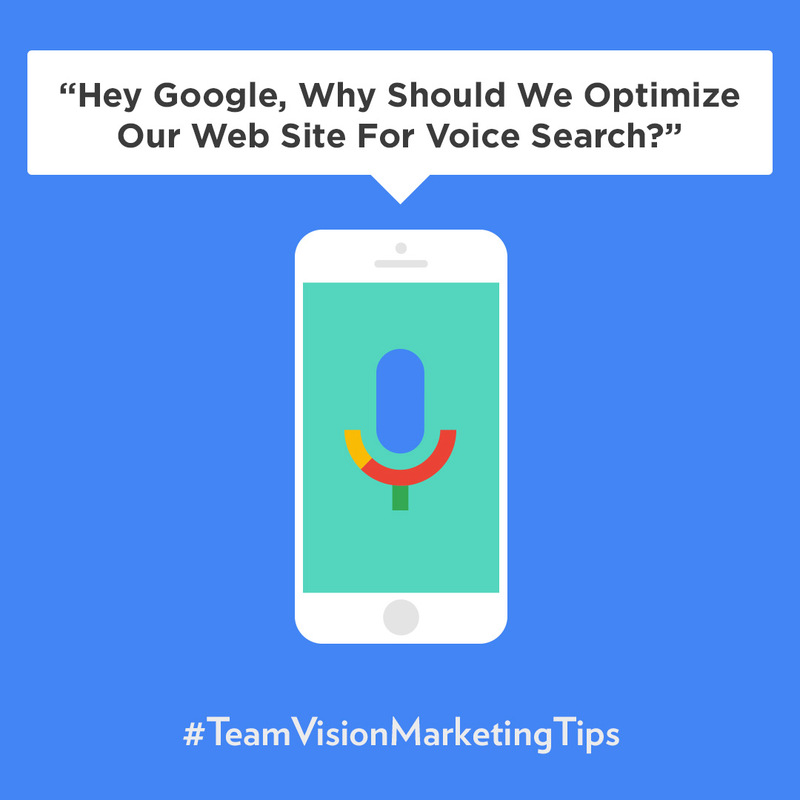 Team Vision recommends researching what common questions your audience might ask in a voice search that relates to your business and title your FAQs exactly like that. 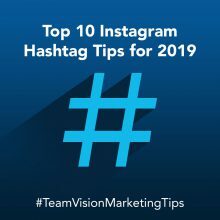 For example, a possible voice search question and FAQ for Team Vision could be: “What is a full-service marketing agency?”. Tip: As previously mentioned, keep in mind that voice searches are more conversational, so adopt a casual tone for the FAQ title and content. 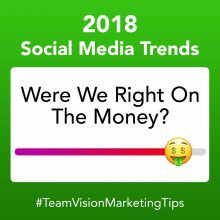 In 2014, Google created Quick Answers, a more convenient method of pulling up content relevant to certain inquiries, like “how to…” or “what is…” searches, from specific web sites. This Quick Answers box is featured above the first organic result of the SERP and includes the link to the page. See an example below. Web pages featured in the Quick Answers box are determined by the web page’s SEO, quality, data structure, and relevance to the search inquiry. How does this relate to voice search? Voice searches tend to be direct questions. Google will favor citing high-quality pages that are also optimized with long tail keywords. Voice-activated technology will continue to change the way we surf and shop online. It’s a self-learning AI technology that will inevitably become more and more sophisticated, so businesses need to constantly update and adapt their digital marketing and SEO strategies. Don’t stress about it! 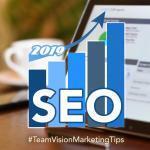 Team Vision can help you with all your online marketing and SEO needs. 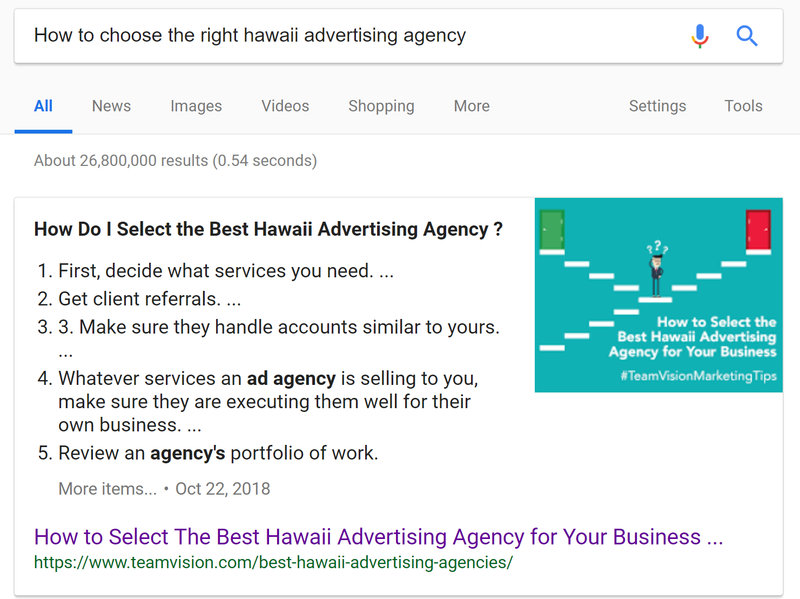 Over the years, we have developed hundreds of successful SEO and online marketing programs and created many responsive web site designs for clients across Hawai’i. 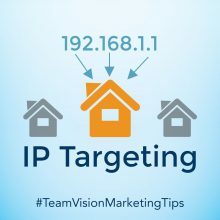 Just give us a call at (808) 536-0416, or use our website inquiry form at www.teamvision.com/contact. Hear from Harry A. Saunders, President of Castle & Cooke Hawaii, on his 20 years of experience working with Team Vision.